This cross-sectional study conducted to determine the differences in selected performance indicator between winning and losing teams in Vancouver World Rugby Series season 2015/2016. A total of 45 matches in this tournament were analyzed using hand notational analysis. The data analyzed using Statistical Package for Social Science version 19 (SPSS ver. 19) with the significance level was set at p < 0.05. Mann–Whitney Test was used to determine the differences in selected performance indicator between winning teams and losing teams. There were five significant indicators (try scoring, conversion, line out lost, line break, and turn over won) from the overall eighteen performance indicator that used in this study. Finding from this research will be suggested to coach to be implemented in training to prepare a winning team. Higham, D. G., Hopkins, W. G., Pyne, D. B., & Anson, J. M. (2014b). Relationships between rugby sevens performance indicators and international tournament outcomes. 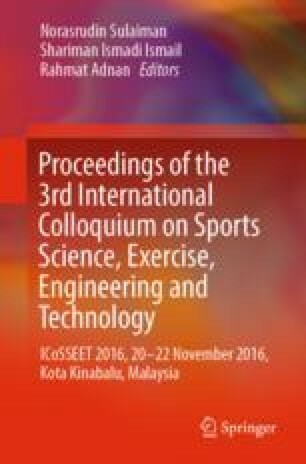 Journal of Quantitative Analysis in Sports, 10(1). https://doi.org/10.1515/jqas-2013-0095.